June is National Safety Month and ANVER Corporation is demonstrating its commitment to help reduce accidental injuries at work by reminding those who operate vacuum lifters to always practice preventative maintenance and best safety practices. 1) Never attempt to operate a lifter until you read and understand the User’s Guide. Below-the-Hook lifting devices should only be operated by properly trained, designated personnel, familiar with the American Society of Mechanical Engineers (ASME) B30.20-2013 Safety Standards. 2) Always practice routine maintenance according to the recommended schedule for your lifter, and keep an inspection, testing, and maintenance log. 3) Do not operate a malfunctioning lifter or one with an “Out of Order” tag. 4) Do not use lifters for purposes other than designated ones. 5) Make sure every load is free of dirt, debris, straps, etc. for an optimal vacuum pad grip. 6) Make an initial attach and slight lift. Check that your vacuum is to spec. and holding tight at a solid vacuum level with no leakage. Once confirmed, continue to pick and place the load. 7) Ensure your load is balanced as it is lifted and vacuum pads have an equal load. 8) Handle the crane hoist in a steady, smooth manner and minimize abrupt movements. 9) Never lift or transport loads over personnel. Make sure you and all persons are clear of the load while lifting and maneuvering it. 10) Replace labels that do not clearly display instructions, cautionary information, or pictograms. Do not use a lifter when capacity, weight, or safety markings are missing. For Preventative maintenance, routine inspections, and proper operation are key factors for safety in the work place. 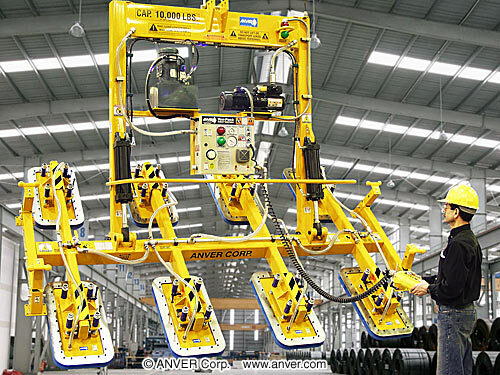 Contact ANVER to learn more about best safety practices and additional safety components for vacuum lifting devices.